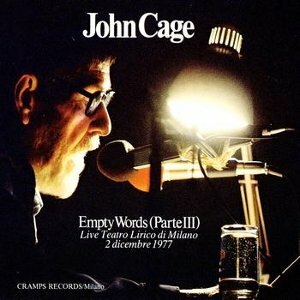 The evening of December 2nd, 1977, John Cage performed his Empty Words (Part III) at the Teatro Lirico in Milan. The American composer was invited by the radio station Canale 96, thanks also to Gianni Sassi of Cramps Records which had published two albums featuring works by Cage, as he was considered a radical exponent of the international music scene. Empty Words is a work for voice based on Henry David Thoreau's Journal (the text can be found in the Cage book Empty Words: writings '73-'78) whose duration rounds up to ten hours approximately, but of which only the third part was performed in Milan. By means of the I-Ching, Cage had first erased sentences, then words and finally syllables rarefying Thoreau's original text and gradually transforming it into an universe of simple sounds. While Cage was reading his text, a bunch of drawings extracted from the Journal which Thoreau had scattered through his work, were projected on a luminous board. The audience belonged to the youth generation mainly, many of whom were not ready for Cage's music. Maybe they were attracted by the reactions that the works of Cage had provoked in the classical music realm, deranged by his innovative thought. Therefore the sonorous event planned by John Cage morphed into an happening, to quote a term dear to Cage, animated by unexpected consequences. At first the audience listened to the piece intriguingly, but soon enough it realized that the 'concert' it was attending was not anything near to what it could be imagined. Some spectators then began to scream, hoot and protest; some even climbed on the stage to disturb Cage's performance, while he was quietly reading his text sitting at a desk illuminated by a small lamp. In spite of the mess and the impolite behavior of a part of the audience – someone even took his glasses off temporarily – Cage continued his 'concert' until the very end when, quite unexpectedly considering how the show had commenced, the audience burst into a big applause. Everybody agreed that Cage 'had won' and that the audience had rightly paid homage to the composer. From the collection of articles extracted from various Italian newspapers at the bottom of this page, it can be inferred how Cage's performance was differently appreciated and perceived. Cramps Records published the recording of such performance of Empty Words. The booing and shouting of the audience can be heard in the background of the syllables pronounced by Cage. In its booklet, the original text read by Cage is featured. Moving to the video footage available, journalist Renato Marengo realized a report for RAI television in which he gathered the impressions of the audience entering the venue before the concert and filmed part of it, including the chaos and the startling ending (as you can see below). Later, Roberto Leydi hosted a television program in which Cage, accompanied by Juan Hidalgo and Walter Marchetti, who had assisted Cage in those days, recounted his reflections upon the event. Last, you may find in the interviews section the long interview that Maurizio Comandini, one of the spectators of the concert, did with Cage after the show at the Teatro Lirico. This interview was published in 2007 on the website All About Jazz Italia. Friday, December 2, at the Teatro Lirico in Milan, there will be a unique concert by John Cage, the master of the modern electronic music composers. The uniqueness of the event consists of: the European premiere of Branches; the singularity of an event that will not be replicated in any other European city and the performance by the author himself, something very rare in these last years. The concert is organized by Radio Canale 96 together with Consorzio Comunicazione Sonora and it is addressed to a young audience. The press conference preceding the concert will focus on the presentation of the record Cheap Imitation and the book For the birds. Cheap Imitation is totally performed by Cage at the piano and it is the best document of the American composer to date, expressly made for phonographic reproduction. For the birds, the book translated into Italian by musicologist Walter Marchetti, gathers various conversations between French musicologist Daniel Charles, who curated the volume, and John Cage. Last Italian appearance of the composer, in Rome at Teatro delle Arti five years ago, is vividly remembered. Cage surprised everybody once again with his happenings outside the theater, before the concert in the hall began, in front of an astonished audience. In his upcoming concert at Teatro Lirico we will surely enjoy the new follies of the sixty-five years old American innovator. Prophet of music as negation, as anarchic and aleatory gesture, John Cage, sixty-five years old, American, follows the macrobiotic diet. Why? I had serious physical troubles, eight months ago Yoko Ono introduced me to the macrobiotic diet. I feel much better now. Is there some connection between your music and your diet? Do you have difficulties in the creation of a new piece of music? I can always bump into them. However, now I'm dealing with the violin, I work a lot and I collaborate with an extraordinary musician, Zufowski. Why are you in Italy? I am doing a project for Dams in Bologna. Alla ricerca del silenzio perduto. I will introduce the idea of a prepared train: three trains will leave for different locations, with no schedule or precise indication. They will host people, make sounds. It will be my music. A new book on you is about to be released. Its title is For the birds. What does it mean? My name is Cage, but I am for the birds, for freedom, not for cages. The book features a collection of dialogues between me and Daniel Charles in a very simple and plain language. It can be useful to understand my musical experiences and my ideas. How does tonight's concert at Lirico work? It's called Empty Words. In the complete work, which lasts twelve hours and it is made of four parts, we gradually move from language toward music. Here we will hear the third part only (two hours and a half), one of the middle ones, more musical than language-oriented. The text are syllables from H.D. Thoreau's Journal. After some years, Cage is in Italy again thanks to the Consorzio di comunicazione sonora (an institution that gathers various music labels, one of which, Cramps Records, has just released a new album, Cheap Imitation, by Cage himself). Twenty years have almost passed since 1958, when Cage – a disciple of Schonberg – was invited in Darmstadt and became famous in Europe and turned into a sort of catalyst for crisis, doubt, contradiction before the eyes of the musical avantgarde of the time. When Bruno Maderna stated we cannot say we are not Cagean he did not mean, I believe, a simple derivative link, but he rather remarked the stimulating presence Cage exerted not only in the field of music. Because it was Cage's conceptual attitude that determined so many reactions and debates: it was the negation of the work of art as a finite product conceived by the artist (like art is understood in the Western tradition); it was his echoing the Eastern thought, particularly Zen; the refusal of dialectic, the theorized need of indeterminacy, because music is any sound and there is no reason to organize it in accord with precise laws. The harshness of the reactions he provoked clashes (though not surprisingly) with the quiet mildness possessed by the character; with the extreme affability and enigmatic smile that accompany him: even in our brief meeting. We had just started to talk at the beginning of our interview about this, when Cage, who had returned from Bologna, began to explain the project he was commissioned by the Teatro Comunale for next summer. We then discuss a little bit about Empty Words, the work he will perform tonight at Teatro Lirico for the first time in Europe. On the pamphlet that will be distributed in the hall it is written: A blend of syllables and letters obtained from Thoreau's Journal by means of chance operations via the I-Ching. The projected slides will show some drawings made by Thoreau himself... The reading will last two hours and a half. The attending audience may go out of the hall and come back later. He also adds: Thoreau said that when he heard a phrase, he was hearing feet marching; a friend of mine, Norman Brown, used to say that syntax, or the way a sentence is structured, is the arrangement of the army; and I would like to demilitarize language. Empty Words does this: there is no sense, nothing is said and instead sounds which come from words are produced, but that don't mean anything. It's the kind of language people speak when they are in love, when they don't try to subdue each other. When they love each other they talk nonsense, when they fight they build sentences. There is a strong link... (incomplete, new answer follows) There is a strong link and there is a wonderful story in our century about this kind of work. I believe that there are many ways to do it and I simply redirect my energies to further it and, hopefully, to shed some light upon it. I wouldn't use it, as again it alludes the idea of the army. It can be noted that in my work there is no repetition, and everyone should find his own path, because the path is not marked. It's like we were in a forest: it has no paths, so one has to find his own way out. We'll see what happens. I hope people will not be too depressed or unhappy and that will figure out a way to appreciate it. If someone actually listens to it, it's interesting. But sometimes people don't listen. Sometimes they are so much biased and filled with ideas on what they are about to hear... It will go on for a long time, which is why I wrote on the program that people can go out and come back, if they wish, or just go away without returning. And there will be Thoreau's drawings too. So that there will be both something to hear and something to watch. There is an arrangement determined by chance operations (by means of the I-Ching); it's an arrangement that resembles that forest we were speaking of before, rather than the army. It looks like the complexity of a forest, rather than a blueprint of the human mind. I think he was a magnificent artist... when we look at the drawings, we can see the links to modern and Eastern art. If we leave these drawings in the Journal, they seem to tell us something. I think that the way we get bored and we make ourselves unhappy during our lives depends on the thought that things mean something. When we realize that they don't necessarily mean anything, then the world changes and we fully appreciate it. It is so simple, however there is so few people who know how to do it. He insists on multiplicity: We live in a complex world: I believe we shouldn't worry about it, we should plunge into it and swim. Many recent works of mine are dealing with some other's works, like Satie, Thoreau and more recently Joyce's Finnegans Wake. The idea underlying them, is that instead of staying distant from the work of artists we love, we could make something out of it. Mr. Cage, you were born in 1912. In 1937 you wrote your first essay in which you coined the term experimental music. Its title was quite meaningful: The future of music: credo. That could be considered the departure of yesterday's and today's avantgarde in music: electronic, graphic and aleatory music, music for tape, musical and theatrical happenings. The avantgarde artists are all younger than you, how would you explain your being ahead of time? It's because of my father. My father was an inventor and since I was a child, I admired his fascinating projects. He invented a submarine thrust by a gas propeller. When WWI began, a new engine had to be conceived in order to eliminate the bubbles on the surface of the water that made the submarine detectable. As he was on it, my father also invented a useful device to locate the German submarines, a precursor of radar. Are you an engineer other than a musician? No, I have just absorbed from my father this passion for technicality. I have always wished to be an artist, I have only been uncertain whether being a musician or a painter. A real American, perhaps the most inventive living musician, Cage possesses an extraordinary and immediate appeal. It's unclear how he does it. He's usually quiet, but always very kind, open, merry and absolutely ironic. And attentive about what is happening around him. You are considered the greatest American living composer (the audience cheers him, he remains silent and still as if the whole thing were not regarding him). You have two primary musical fathers: Varèse and Ives. Whom do you prefer? Varèse when I listen to Varèse and Ives when I listen to Ives. But there is a big difference between them: Ives is absolutely, completely American. Varèse is a European who discovered America and from whom America discovered Europe. Did you meet Pollock? He's about your age and in some respect, he's your homologue in painting. I met Pollock, but we weren't good friends. My good friends among the painters are Rauschemberg, Morris Graves, Jasper Johns. Also this fact has to be noted. These are all men who are fifteen years younger than him at least. But I am also friend with Marc Tobey and I really love Marcel Duchamp. Duchamp: a legendary figure who has been recognized both in Europe and America, and who avenged Paris for losing its cultural supremacy. Did you come to Italy many times? I came when I was young: Naples, Capri. Then I stayed for a long time in Milan, to work with Luciano Berio and the technician Marino Zuccheri at the Phonology Institute, around twenty years ago. Today I am performing a musical piece in Milan and next summer I will be in Bologna. You have been a tv character twenty years ago. Yes, Luciano Berio and Rai convinced me to participate at Mike Bongiorno's quiz show Lascia o raddoppia. As a mushroom expert. I love fungi so much: I study them, I hunt them, I know them. I was sent my mushroom books from America, I carefully studied them and I won the jackpot. Five millions, I think. Did you also perform some music of yours during the quiz show? Yes, two pieces. The first entitled Water Walk: I used a bucket to obtain certain sound effects; and Sounds of Venice, which was based on folk songs. People could think of an eccentric show, but I was totally serious. The two pieces are published by my editor. This year wasn't a good one for mushrooms. Yes, almost everywhere. And I have been very unlucky indeed. As I travel so much, I always arrived into places when the mushroom season was over. Tonight (actually the concert was on December 2nd, 1977) you will perform a concert, so to speak. What's happening? The Spanish avantgarde musician Juan Hidalgo (born in 1927) who is accompanying Cage answers on his behalf: It's a complex performance which lasts more than two hours. Cage reads a text following musical rhythms, truncating words, lingering on some consonants: in front of him there is a screen on which drawings by Henry Thoreau are projected. These are also structured in accord with the composer's intention. The audience is not forced to stay still for two hours and a half: it can stand up, go away or come back after having rest and smoking a cigarette. What about Bologna, next summer? Cage smiles very pleased. The idea of Tito Gotti, the famous director of the traditional Feste Musicali, is this: music on the train and train that carries the music to towns. The train can be composed by two or three cars for postage or luggage where the performers can stay and the audience can walk around them. Then there will be some normal cars for passengers where the audience or the performers can temporarily sit. The train will be also equipped with an electro-acoustic system which makes any kind of feedback, mixing or tuning possible, such as the live production of electronic sounds, or the playing of magnetic tapes. When the train stops in the stations, it will host the inhabitants and welcome them aboard if they wish, as the return trip in the evening is planned. The musical performance can be continuous or intermittent. It could happen during the trip and the stops, for which some peculiar programs could be conceived. The sound amplification and feedback can also be spread outside the train for those who would like to listen without getting on the train. After all it could have some performers getting off the train to play outdoors or inside the stations. The Italian railroad company has already certified the possibility to make all this. Cage himself has traveled on those trains to study the sound of trains and rails around those areas. The entire happening, of which many details are still unknown, will be directed, that is imagined and prepared by John Cage. Last question: how would you summarize your experience? I don't know what my experience is yet. I am still and always experimenting. I am alive, experimentation is life, every moment. For Cage, without being intellectual, the future of music is still the same after 40 years: credo. John Cage, 65 years old, the American guru of avantgarde, performed yesterday at the Teatro Lirico in Milan for two and half hours consecutively, while the young spectators bombarded him with pillows and the strangest objects: curtains, wood sticks, mirrors, plastic bags filled with water. They mocked him calling him menopausal hippie and eventually insulted him: Quit joking, play some music! Everyone shouting You fool, you fool , repeatedly invading the stage, beating him, pushing him, almost getting into a fight. At the end of the concert however, John Cage thanked the roaring audience for the wholesome liveliness, for the creativity and for having protested with such an energetic fire against his music, based on monotone, unstructured, aseptic sounds, accompanied by visual stimuli: slides representing skeletal shapes, archaic signs, prehistorical animals. My purpose in fact – Cage tells us – is to provoke the audience, to generate problems, to enliven it. And tonight I managed to do it. Is the American musician, the only one maintaining cold blood while the audience was smashing the chairs, unhinging the theater doors, throwing firecrackers and lighting matches on the stage, sincere? Didn't he even panic for a moment? I am very old and I don't have time to be afraid anymore Cage told us. He added that he was very happy to have participated at the concert at Lirico. An incredible happening in which the spectators became the real protagonists who introduced, after being enticed by my musical stimuli, the violence and contradictions of the reality surrounding us. Who is John Cage anyway? How many among the 2500 young people gathered last night inside the Teatro Lirico know this enduring revolutionary, inventor of variable and multifaceted forms, of the usage of instruments for the production of unheard sounds, as pieces of glass, cactus, tin boxes and the famous piano prepared with various metal materials shoved into its chords, whose sound becomes soft and short, similar to the one of the harpsichord. What does music mean to Cage? To me – Cage says – life is music, insomuch that in my repertoire I tried to reproduce sounds that from a musical point of view were prohibited or absurd like the step of an ant on grass. The attitude I developed while studying Eastern cultures, is to consider everyday life more interesting than any form of rite. We become aware of this when our intentions are reduced to zero. Then, all of a sudden we realize that the world is magical. From a musical perspective, there is one thing which makes everyday life more fascinating and special than the concert routine: it is the variety of sounds in respect to any other thing. Surely it is not easy to penetrate the world of Cage. Screaming like those young people last night is not enough: Shut up for a moment, tell us, let us understand while Cage, with gray hair and beard, wearing jeans, seated still in front a small table, was slowly whispering words into the mic with nonchalance, as in 1959, when during the quiz show Lascia o raddoppia in which he was a contestant on mycology, Mike Bongiorno told him: I am sorry that you are leaving us. I am, but I hope my work remains Cage replied as he was finishing one of his compositions. And Mike immediately added: What a pity, I would have liked you to have stayed and your sounds to have gone away instead. The encounter between John Cage and the public in Milan has fallen from the sky like an unexpected gift, with no fixed program, no warning. He arrived at the Malpensa airport from New York two days ago, he went to Bologna for a project he will fulfill next summer, he gave a press conference and Friday evening, on the behalf of Canale 96 and Consorzio Comunicazione Sonora, he entered the Teatro Lirico filled with a young crowd who had gathered animated by diverse expectations, but above all, in search for a kind of music which, as Frederic Rzewski once defined, anyone could understand without preparation, a music based on the idea of game. The evening started with a brief introduction by one of the promoters who, instead of explaining the enormous and most likely insuperable difficulties that such an approach to Cage's music would face, like to any other music that requires a barely minimal knowledge of it, preferred to reiterate his appeal to the city government for a fund to support valid alternative cultures. John Cage walked on stage shortly after, welcomed with a warm applause. The equipment on the stage for his recital was	: on the right a small table with a microphone and a lamp. In the middle a screen where some slides had to be projected. The hall turned dark. Pitch black. 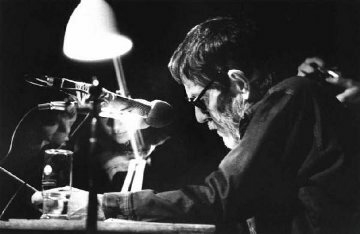 John Cage sat down, wore his glasses and began to read speaking in the microphone. The program consisted of the reading for two and a half hours of Empty Words, a very recent work of the American composer. This work, written breaking Thoreau's Journal apart into bits re-arranged by means of chance operations determined by the I-Ching, cannot be accessed by who does not give up himself to the fascinating and ecstatic flow of music. It is a barely perceptible ripple of the word that casts the musical spell, that let some consonants and phonemes emerge and become a strong suggestion in accord with the rules of the I-Ching, the Chinese oracular book that offers an interpretation of music permeating life, where art – as Cage himself said – is seen like a light shining at the top of the mountain, penetrating in some ways the surrounding darkness. It is possible to sense this in an attentive silence, that did not last more than few minutes at the Teatro Lirico. Maybe, even without violating or being aware of the general rules of the Cagean game, a part of the public created an unexpected counterpoint effect to the Cagean lecture, only suffering from lack of invention and responding to the composer's inner richness – so essential, so subtly and intensely persuasive – with unimaginative reactions. First the interruptions commenced, followed by a flourishing of jokes that changed with the point of view from which they were coming. Someone sang Va' pensiero, someone else tried a more satyric nuance emitting Mamma, mormora la piccina. Other people replied to the Cagean sorcery repeating verses from the liturgy. Someone ironically invoked Betty Curtis, Arigliano or muttered other similar niceties. Someone instead spread the idea that the guy on the stage wasn't Cage, but an impostor and that it was about time that the real one would eventually appear. Cage, tied to his table and microphone, seemed an unreal, but firm figure, against which the current of words, slogans, songs was magically dispersing. Happy and not realizing the turmoil that was stirring the hall. One hour later, someone started to walk on stage and some closer sparks tested how coherent this disciple of Zen was. So they began to drink the water from his glass as if it were a fountain, they held his microphone to give confused speeches, they mimicked some gestures in front of him. The wave was mounting: a group surrounded him and slowly tried to interrupt the magic of the Cagean piece, which at that point had become so fine, putting out the lamp, taking his glasses off and winding him with a scarf. Cage remained impassible, he untangled almost with nonchalance from what was happening around him and that was hindering his lecture. It went on for two hours and a half as it was announced at the beginning. Then he stood up, he went across the group of people circling him and he thanked the public with a slight bow and calmly got off the stage with a sovereign mildness. The almost inhuman mildness is the factor that dominated this extraordinary Cagean experience in Milan. A prophet and a musician bigger than his greatest fans were imagining. Who asked him the following day about his opinion of the previous evening, he answered that everything seemed light and irrelevant, a game that did not need further comments. Two hours and a half of incredible mess or boredom for those, ignoring the picturesque show given by the agitated audience, tried to follow what John Cage, with moving perseverance, was attempting to offer from the stage of the Teatro Lirico last evening. Ironically, the spectacle commenced in a very favorable situation. A great crowd of youngsters had responded to the appeal of the promoters, Radio Canale 96 and Consorzio di Comunicazione Sonora (which is basically Cramps Records, the label that publishes all kinds of progressive music), enticed by the explicitly alternative character of the concert and filling the venue completely. It was, more or less, the audience of the students rallies, of the sit-ins and, why not, of pop music concerts. Therefore an audience who was anxious to attend a satiric rite that the presence of the master of musical avantgarde supposedly guaranteed. An audience who agreed from the very beginning with the mockery of institutions, open to any revolutionary message. That is why Cage was optimist: the concert (though concert is not exactly the right term) host, who had laid an ideal red carpet made of liberal mottoes, said it: Cage was delighted to confront with the so called basis reality and to bring his alternative ideas to those people who believe these are mandatory. It did not go as he had probably hoped however. Not due to the difficulty to perceive his alternative message or due to its boldness: there was simply no message whatsoever and the little homemade show that Cage had put up was more boring than anyone could ever imagine. And revolution can be anything, but boring. Here is what John Cage had planned. He sat down in front a small table with a projector and he began to screen some elementary black and white drawings (which seemed a parade of mysteriuos objects from a yet unforgotten quiz show). During the projection, he muttered nonsense (or maybe magical formulas, maybe not: just like the drawings anyway) words interrupted by quiet hollers, hiccups and isolated barks that were inevitably welcomed with applauses, perhaps because varietas delectat. No sign of music. It went on for two hours and a half, during which the audience, who became impatient after few minutes, began its own show, eventually invading the stage without any idea about what to do there once having reached it. Any sort of slogan could be heard: Viva Verdi! , We want Betty Curtis! , Conservative! We don't accept provocations! There was also who wanted to rationalize the situation, warning the public that all those protests were middle-class inclined, hence denying the function of the avantgarde. Despite of the many youngsters around him – they were staring at him as if he were a strange animal and treated him disrespectfully in every possible way (someone drank his water, another one turned his light off, others were throwing firecrackers at his feet) – Cage continued stoically until the end, when he was hailed with a roaring and deriding applause from the people who had remained in the theater and who were just craving for some silence. Cage then pretended to believe in the applause and appeared on stage with a big smile. Miscomprehended art or mystification in disguise? John Cage would reply that such definitions don't mean anything and that were established by who is ruling the government. In some way or another, he always wins. The most relevant trace that is left from John Cage's performance at the Teatro Lirico, is the identical behavior by some of the youngsters, the so called basis, gathered by Canale 96, and the most reactionary parts of the audience usually attending the premieres at La Scala: the intolerant reaction towards the diverse, the freak (or at least different from what it was expected). I really think that the middle-class indignation towards the Dadaists, more than fifty years ago, was quite similar. But that is not consoling either. What happened at Teatro Lirico? Cage began at 9.30pm and finished at midnight, impassibly furthering his performance with no interruption: he was declaiming the third part of Empty Words, slowly reading and alternating pauses and long silences with deformed words deprived of meaning, offered just as sounds. The meagerness of the musical material and the absolutely disarmed way to propose it, baffled the audience and provoked reactions that, started as ironic applauses after ten minutes, became more and more intense, persistent and overwhelming half hour later and peeked after one hour and a half, when the stage was occupied and Cage was subjected to all kinds of things that could be done without actually harming him: they took his glasses off, they drank his water, they shut his light off. His disarmed impassibility eventually prevailed, lowing down the tension though still amidst a great state of confusion. When he concluded at midnight, he came to the stage again saluting the audience very kindly, he received an applause and disappeared afterwards. Who is familiar with Cage's poetry is aware that his performances welcome the participation and response of the attendees, and they are conceived to include them in every possible way. We happened to know in fact that he was definitely serene and pleased after the concert. Nevertheless, it does not relieve us from the reaction of the most animated part of the audience: a poor, unimaginative answer indeed, endowed with little irony and obvious slogans, banal jokes and even firecrackers. A pure and simple intolerant outburst, despite limited to a bunch of people only. Moreover, it does not console us knowing that some people were expecting something similar to a rock concert or that many who were filling the venue were just attracted by a name, which they did not know anything about. 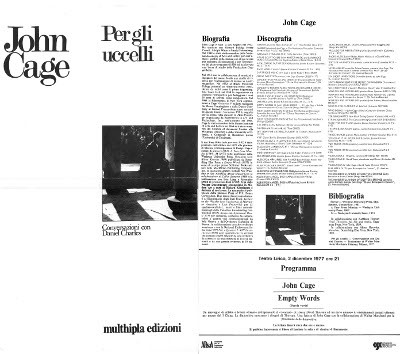 The way Cage was introduced by Canale 96 also favored misunderstanding and ignorance: the same ignorance that inopportunely arranged in the same day both a Cage performance and a concert dedicated to Webern and Ligeti in a city like Milan, where so little information about contemporary musical events is circulating. The protests and the hollers began almost immediately, as soon as the two (maybe three) thousand youngsters (encompassing the whole liberal area up to the more extreme autonomous groups) filling the Teatro Lirico, realized that the music would not change until the end of the concert and that John Cage would continue to read his Empty Words without touching any instrument. Come on, play us music! A flute, a whistle, do something! was one of the most moderate comments among those which were heard. The other ones are not difficult to imagine. There were insults for everyone: for the press that had promoted without informing; for the hosts (Canale 96 radio and Consorzio di Comunicazione Sonora) that advertised a tough pronounce exercise like a concert and imposed an entrance ticket (2500), which was reckoned too expensive. And finally for Cage, who became after half hour, the only target. The din then soared to a dense and throbbing level of sound, interrupted every now and then by more meaningful or more gestural moments: alternative choruses, rhythm-ed claps, whistles, objects, liquids or paper throwing, pacific occupation of the stage, interruption attempts, improvised dances and ritual gestures. The audience morphed into that powerful source of musical events that Cage's methodical and cumbersome reading was aiming at. It has been more than 30 years since Cage has known the art of provocation: he is experienced and evilly persistent. Twenty years later John Cage is presenting his music again; this time without instruments, using the most natural and thorough medium: the human person. One two three many Cage-s are sitting at the table, so palely illuminated that reminds us of a laboratory; one two three many Cage-s are seated in the chairs, standing up, conquering the stage, trying to annoy Hamlet's specter that is rambling around the unhappy rows, pleased to have regenerated the fiction of the pagliacci. The music of Cage embarrasses the connoisseurs' ears. The theater of cruelty renovates each time a new rarefied black and white drawing slides on the screen, paced with the pauses and the incestuous sound of vocal chords vibrated with chaste parsimony. The show is complete as it winds and unwinds a play that does not care of either one ways or direct meanings. Don Quixote is discontent and keeps on fighting with the mirror which is reflecting his own image unresolved. Cage, old time actor, continues unconcerned about those innocuous presences, carefully paces his recital following a rigorous program that does not leave space for improvisation, but that instead opens spaces to the instinct of the spectator. Unfortunately, the usage of such space has not been exactly creative, since it resulted in the toss of firecrackers, water, toilet paper (someone later remarked that its pink color was the only nice thing), banal curses, embarrassing winks. All signs of a worrying cultural attitude that pervades the Movement or part of it. No one left however. As if a mysterious power forced the audience to stay, like in the villa of the Exterminating Angel. The smile of Cage as he lifted his arms, the vanishing of his up-to-that-moment dauntless mask – everybody was expecting a sad, not so enthusiastic, finish – broke the spell. I'm reading in today's issue of il Manifesto (December 8) an anonymous article: I believe it's a review of a concert or a show-concert, John Cage in Milan. It starts with a grotesque Cage is presenting his music again, using the most natural and thorough medium: the human person (what does the human person do, speaking of sounds, besides singing and talking? Let's not even mention it); then it goes on blathering about two three many Cage-s who are trying to annoy Hamlet's specter that is rambling around the unhappy rows, pleased to have regenerated the fiction of the pagliacci ; or about the incestuous sound of vocal chords vibrated with chaste parsimony ; last, about the show is complete as it winds and unwinds a play that does not care of either one ways or direct meanings and so forth. It also talks of toilet paper, firecrackers, bags of water (which I'd throw at the reviewer rather than at the composer), until we reach the absolute incomprehensibility: the smile of Cage as he lifted his arms, the vanishing of his up-to-that-moment dauntless mask – everybody was expecting a sad, not so enthusiastic, finish – broke the spell. A typo, as usual, evidently: it doesn't make that big difference anyway. Before Cage's concert review, I read Giampiero Cane's one about the Don Carlos rehearsal; I would have liked to write about that, asking myself – due to the proper accusations we address towards l'Unità, which systematically reflects the cultural apathy of the Pci (the Italian communist party) – whether we should not, coherently, strive to give our critique a new slant, tying every single episode as an episode of the recent cultural policy of institutions such as La Scala – generally – of the middle-class in Milan. Instead of a case by case analysis, a logic that doesn't allow us to comprehend reality as a whole and that narrows our critique, as well as the other's, down to a mundane practice, uselessly – in the luckiest case – intelligent. Then I read the piece about Cage with mounting anger; nevertheless, I don't want to believe that evoking the necessary improvement of our critique is a luxury we cannot afford, given our current level. This would imply to put il Manifesto in an inferior place than he owes and often deserves. We must shoot at the reviewer, with no mercy; with a blank bullet – but noisily – when it's Giampiero Cane and with loads of lethal ammunition when it's the anonymous reviewer of Cage's concert. And we must seriously begin a global study that no one wants to initiate for example, speaking of contemporary music, resuming the persuasive analysis, that we had sketched some time ago, which commenced with Luigi Nono. And on the same note, talk about the usage of music, which is not new, and of any other cultural event. In order to become the kind of newspaper that we're aiming at. An weaker effort than this is not enough and it doesn't help either. Sunday evening. Four days after the Lirico thing, the weird Cage thing (this is the third time I try to describe it), which happened on day 2, the same day of the workers in Rome and of the comrades in jail, yet in Rome at the university. So, huge crowd at the Lirico: middle-class and left-wing, selected or not, young generation and real avantgarde connoisseurs. Filled venue, but not fully packed: last ones made it safely for the Canale 96 opening speech: The price for the ticket is high (2500 lire), but who wants to protest should go and complain with the city hall that is asking for so much money. Stage is empty: white screen in the background, a small table with a lamp; a glass of water and a microphone; behind a curtain a recording system can be glimpsed. Suspiciously. Yesterday a friend of mine told me that she though it was the table of the stage whisperer. The absolute absence of instruments was suspicious: neither a guitar nor any kind of device. The only item that could be played was the glass of water. Therefore this must be recalled: the newspaper advertisements introducing Cage. How is it? Tonight there's Cage in Milan, Cage the real revolutionary avantgarde jazzman. They say that in his last record he does not even play a note! Unfortunately, who is here thinks he will play something: either a can, or a Jew's harp. They believe he will play. The audience is requested not to smoke. Joints are everywhere. The first part of the concert begins. Cage enters, he rapidly makes a nice bow and sits down. As he puts is mouth close to the microphone, he unfolds some paper sheets and starts to read. He mutters something incomprehensible but paced. Meaningless words, inarticulate letters. At one point he spelled Pound. I'm sure. On the screen some early Christian images, some sort of grass rake, a prehistoric fish and those inarticulate words pronounced with an inflected low voice. Maybe Pound is really part of it... ten minutes and the cough begins... Cage keeps on mumbling; then the first loud comments: Give us Orietta Bberti! and the literate rebukes: Shut up, you fool . Cage doesn't even rise the tone of his voice, hence it goes like this: fool, firecrackers, metal bolts, everybody on their feet, Fratelli d'Italia (Italian national anthem), a bottle of water, a devastated stage, people climbing on it to put the light out and pour the glass of water on his paper sheets. There's a woman next to me who is laughing from the beginning. Maybe because of the literate sentences like: Why don't they go away, if the don't like it? Don't they know that he stayed three hours seated in front of a piano in New York to stare at the keyboard without playing a single note? In Tokio he brought on stage an Indian who punched his chest and that's it. Maybe she is laughing because of some other slogans: Give us our money back! , Power to the working class , Let's gather , Piece of s... we can't take it anymore! Or maybe due to the stupidity of who was blaming this lonely, unknown old guy just because he was sitting in the middle of the stage. For the stupidity of a jazz avantgarde: what the heck this lonely guy is doing alone on stage muttering words before a throng who dispelled Santana, Lolli, De Gregori and others after three minutes? Or maybe for the odd love-hate dialectic between Cage and the audience; she was laughing anyway and Cage before midnight, actually right at midnight stood up, said goodbye and went away. Result: a damaged stage that has to be repaired. The concert ended up on time, not a minute before. The ultimate fact that could break the spell-subordination star-audience link didn't happen. The star remained despite of everything to the very end, the counterpart of a huge crowd who could have said and done more interesting things rather than his unappreciated muttering. The provocation was accepted, embracing a submissive logic. We (almost) all paid 2500 lire. 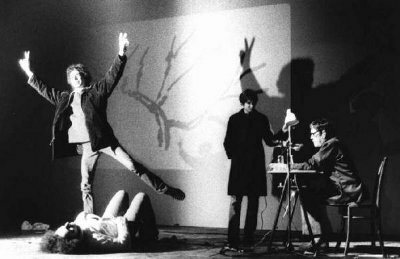 Saturday afternoon a listener called Canale 96, the radio that had arranged John Cage's concert, saying that it had posed a big question to the Movement: to choose between survival and life. During the incredible pandemonium that took place Friday evening at the Lirico, the choice was made: yet incomplete, still not profound, but surely the majority of the people chose life. I don't want to judge that evening, in which not only Cage made some music, I just want to share with you my feelings, my opinions. The impact with Cage was devastating, violent, hurting. Two cumbersome hours and a half: someone later defined them as an enormous psychoanalytic session; for some others they released our fears, paranoias, anger, crisis; an evening in which our opinions and evaluation parameters have been challenged. The crowd and Cage destroyed the rite of the concert, a rite that was deeply rooted in our consciences, a rite that starts each time we enter a hall or sit on a lawn, or as we lie in front of a stereo – waiting for the notes to come out of the instruments, for the rhythm to lead us, to make us dream or live a tune with passion. A rite that accepts some variations, like the people are allowed to clap their hands or sing along; but all of this belongs to the rite. Cage's Empty Words were filled by screams, whistles, gestures of people. They were filled by Cage's personality as well, who amidst the heavy storm seemed to be granitic (Irresponsibility? Calculated craziness? Mockery? Or deep pleasure because the Empty Words were absorbed, vetted and thrown again at him by the crowd?) up to the end, when he also physically joined the big dolorous game with his body, welcomed by a roar of anger, irony, admiration and relief since the show was finally finished. Some comrades pointed out that – in spite of the great dissent and unease – the majority of the people remained to the very end. Some others pointed out instead how the anti-Cage front was unable to stay compact and stop him. Comrades! If we go on with the mess we demonstrate that Cage is right! If we keep silent, we're going to win! If we scream, he's going to win! This was one of the slogans that the comrades on stage were hooting in the microphone. Comrades, we are pissed off by Cage, because he's proving us how much in trouble we are, how much we are unimaginative. Another comrade was shouting from the stage. Friday evening we annihilated a rite, but to reset it we had to put it up: we chose to go and listen to Cage, to sit on a chair and to expect music from him. If the old man plays some music, just some notes, these guys would calm down said a TG2 journalist behind the curtain. We want the Rolling Stones someone yelled from the balcony, testifying how much we still need the tranquility of the things we are accustomed to, that are familiar, although we never fully comprehended. Those things that are safe; that little happy island made of rock music, through which we believe we could change the world. When will we finally abandon it to live our lives and drop survival? The only thing that was missing at the Lirico was an advertisement at the entrance warning: Leave any hope, thee who are coming in. Special mention for the imbeciles: the bunch of fools who creativitized themselves wrecking chairs, doors, curtains, pitching firecrackers or bags of water at people (risking to fry the comrades on stage by the way). They were the losers of the evening: upset because the rite wasn't fulfilled; always in need of a preacher to predicate certainties, they chose survival, the status quo.